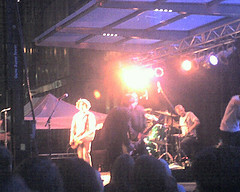 Saw the Hold Steady tonight at 7 WTC as part of the Downtown Music festival. It was an excellent show. The lead singer really looked incredibly happy the whole time. It's been awhile since I saw a band where I knew more than half the songs they were playing, so this was a nice change. I've been listening to the Hold Steady since last December, and I recognized pretty much every song they played tonight.